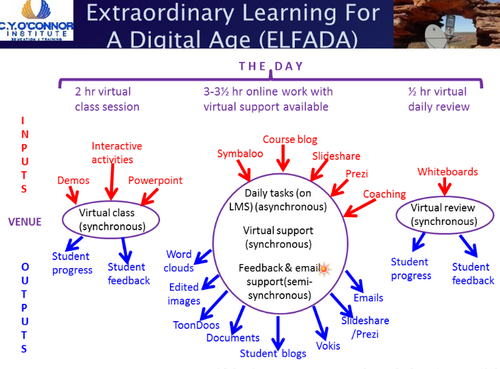 This overview is for three webinars – two Serendipity sessions and a FineFocus about “what isn’t taught in school”. I was about to start a temporary new role working on a project to develop e-learning for a Certificate II (Australian levels) vocational course. This involves being part of a team with specific designated roles eg designer, developer, SME, although mine is a bit “woolly”! A sharp contrast to my usual situation where I am often the sole e-learning designer/developer or the facilitator and main designer/developer for a very small team. The second reason is my current involvement with others from my network in the development of deMOOC which is highly collaborative and informal without the narrow role designations of a formal team. The discussion was wide ranging beginning with a look at “What is instructional design?” We also talked about the pros and cons of need for subject expertise in instructional design and other aspects of the process. This was a session where I was unable to be present – I logged in but was unable to stay due to work commitments. So this is one of those recorded sessions where I needed to access the recording to find our what happened! This was a very small group so was more in the way of a two way conversation than usual. I personally have some reservations about everyone learning to code – analysing systems and developing algorithms is one thing but writing good clean efficient code is very different. I think there are risks involved in that as is currently the case with building websites everyone who has learned by “playing” with the tools thinks they can do this to professional standards. The result with websites is many very poor quality websites built for organisations by amateurs. As always in Serendipity we began this recorded session with a whiteboard for topic ideas. 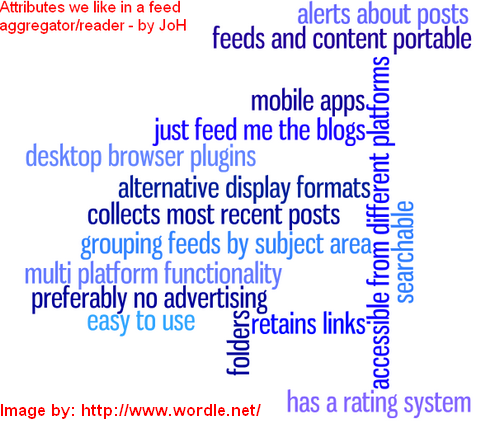 The news that Google is to close GoogleReader was at the forefront and was the chosen topic. This is the second Google product that I use personally where closure has been announced relatively recently, the previous one was iGoogle (due to close in Novemeber). In the light of this our first whiteboard was an opportunity to think about whether we, as individuals, have too many eggs in our Google baskets. The consensus was that on the whole we probably do tend to use too many tools/apps from the one source. We considered briefly the “why?” and it usually comes down to convenience. You only need one login for your GoogleAccount and also the tools/apps often enable cross linking and cross posting to occur fairly seamlessly. Links for a number of possible alternatives for GoogleReader were shared and we also added alternatives to some of the other Google tools/apps. 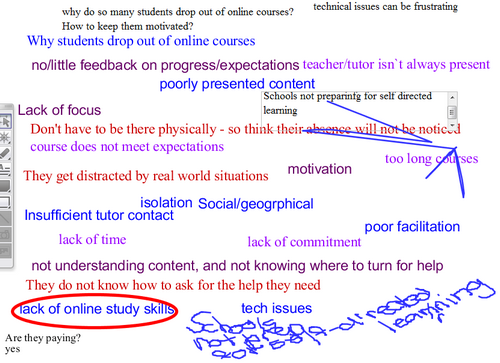 Main takeaways from the session were that there are alternatives – we just need to look even though changing is a pain! Our next Webinar is a FineFocus session. 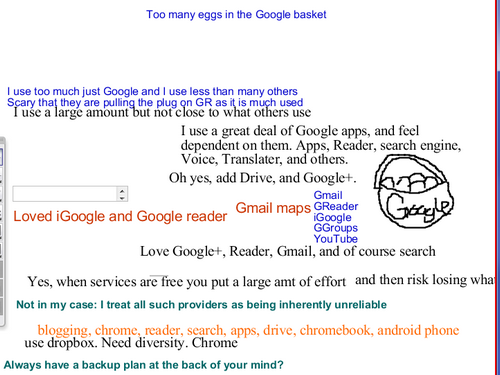 Join us for “Replacing GoogleReader” in which we share and explore some possible replacements for GoogleReader. Join us on Thursday March 21st at 23:00 GMT/UTC the time for you will vary depending on your timezone (check yours here) Thursday afternoon/evening in the USA, late night Thursday in Europe, and Friday morning March 22nd in Australia – in the usual Blackboard Collaborate virtual room. This recorded session was a Serendipity (unconference) session. 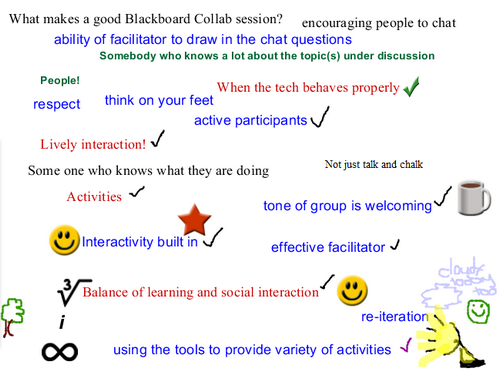 The topic chosen was “What makes a good BlackboardCollaborate session”. A topic about which there was plenty to share! We extended the topic into a “playtime” towards the end of the session. This involved giving everyone moderator privileges and opportunities to try some moderator tools. As always this was fun, albeit slightly chaotic at times. Each time we do this I am made aware of the fact that very few webinars of the many available across the globe provide much in the way of opportunities for participants to interact and perhaps more significantly the opportunity to try out moderator tools and practice developing interactive segments. This has given me food for thought and an idea for semi-regular sessions/workshops focussing on particular tools/interaction types where participants will have the opportunity to develop an interactive segment during the webinar and then share with everyone. This recorded session was one on “Exploring online tools”. On this occasion we took a look at some online infographic creators. As is usual with these sessions we started off with some of our individual thoughts on the meaning of the term “infographic”. This was followed by a look at how many of us used infographics. This revealed that as a group our usage was low with no-one using them more than rarely. When we explore tools we have only a limited time within the webinar so it provides a good test for usefulness in a teaching situation. 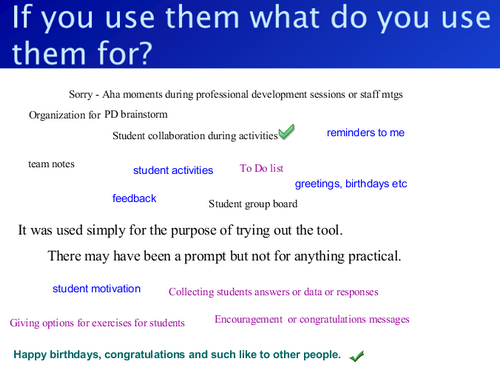 Anything that takes a long time to join and/or to pick up the basic use is not really practical for use with students. This is because if it takes too long for students to learn then learning the tech can become more significant in the “lesson” than the learning objectives. We had four tools to explore – everyone chose a tool and went away to spend 10 minutes exploring. We then shared our opinions and ideas. This was a particularly interesting session because infographic makers were relatively new to all of us. Because we generally felt we needed a bit more time this week we also gave ourselves some homework – to make an infographic to share at the start of the upcoming Serendipity session. 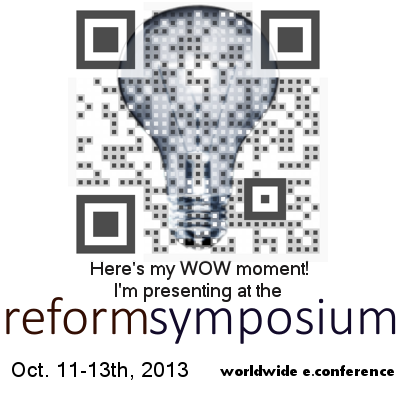 I have made mine and look forward to sharing it in the session! Two fun sessions! Sharing virtual classroom tools is something I love to do so the Serendipity session was particularly enjoyable for me. Exploring tools because it involves high degree of participant activity is also something that I get a lot of satisfaction from. This recorded session was a FineFocus session about how we delivered a pilot (funded by the Australian National Vocational E-Learning Strategy initiative – Partnerships for Participation) adult literacy course entirely online using virtual classroom, blogs and other e-tools. Due to time constraints the focus of the session was very much on the delivery model and strategies used rather than on the student cohort/reasons for adopting the approach. I began the session with a very brief scene setting and then moved on to discuss the delivery model. Initially this was from an overall perspective followed by a more in depth look at how the different aspects fitted together. Blogs formed the core of the student work and we had an online audience poll on blogs which indicated that (unsurprisingly) everyone had some knowledge of blogs. Then we moved on using examples from the “Course Blog” and individual “Student Blogs to illustrate how we used the blogs in the literacy context to enable students to access “How to” information, write for an authentic audience and receive feedback on their work. Although blogs were the main core of student activities we also used a course website (built in the Institute LMS) and virtual class recordings to provide supplementary resources. Links for activities were provided via Symbaloo. The structure of the course helped us to “walk the fine line” between too much control of student activities and potential anarchy and the issues arising from this.! 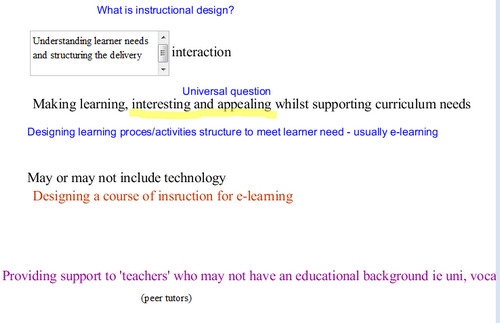 We moved on to look briefly at the project outcomes including some student feedback via Lino.it. This was followed by a “Roaming Challenge” – an opportunity for session participants to access a series of whiteboards individually add their own ideas on how they might use some of the tools and strategies for specifc activities with a particular student cohort. We shared and discussed the ideas briefly and I also shared the outcomes of the same activity from a face-to-face presentation that I did for my own organisation as part of an innovation workshop. We finished up with a second online poll to gather feedback on the session and a “best takeways” board for any other comments. I so much enjoyed doing this session. The project was so exciting to do and because (in my opinion) it was very successful I love to share how we did it. The only sad thing is that my Institute has now stopped all delivery of Certs in General Education both face-to-face and online because of increasing funding constraints brought about by the requirements for public vocational education to be competitive with the private sector. If you have something you would like to present a webinar on please let us know (add a comment to this post, or Tweet us – @JoHart or @philhart). Then join us to facilitate a session about your e-edu passion! If you are not familiar with BlackboardCollaborate we can help you plan how best to do your session so it works for you. Our sessions are small and friendly – the ideal setting for your first webinar. Once again this overview is for two webinars – a FineFocus and a Serendipity. Both sessions were lively and interactive with lots of sharing of ideas annd opinions. Our first FineFocus webinar for 2013 was about using an e-portfolio for Recognition of Prior Learning (RPL). This recorded session was about Phil Hart’s (@philhart) personal journey through the RPL process in gaining higher level vocational qualifications through recognition of his prior experience and learning rather than following a formal course. Phil began the session with whiteboards to elicit some thoughts from the group on the what and when of e-portfolios. 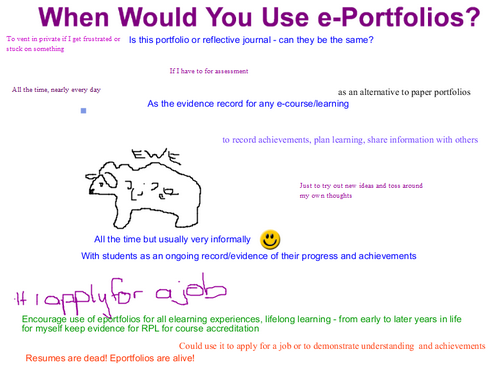 The next part of the session was a brief consideration of the technologies that can be used in e-portfolio building, beginning with a whiteboard for ideas from participants and continuing with Phil’s own mix of tools (a website format) used to produce his Recognition of Prior Learning (RPL) portfolios. This led on to a look at the design objectives of the website and the portfolio structure used, including drilling down through units to performance criterion level. Phil then discussed the assessment process (including the challenge test he completed with the assessors for authentication purposes) and lessons learned. Some of the lessons came out of his first portfolio and were applied in the second and third portfolios to give a more streamlined and focussed product. This was a terrific session – I always find hearing about “personal journeys” fascinating! There were also lots of opportunities for interaction enabling all of us to share our own ideas and experiences of our own and/or student e-portfolios. We started with a blank whiteboard focussing on the “why people drop out” side of the topic. These ideas were developed and extended through discussion in text chat and audio. We then moved on to consider ideas for overcoming the risk of students dropping out. Again this started from a whiteboard and expanded from there into both audio and text chat discussion with many ideas around participative activities, ownership and community. Two great sessions that provided massess of food for thought and reflection as well as many links and strategies. E-portfolios are always a topic of interest as there are probably as many variants as there are people building their own portfolios. Maintaining student motivation and reducing dropout from online courses is one of those issues that most of us are always keen to discuss in our constant search for ways to keep today’s learners energised. Our next Webinar is a FineFocus session. Join us for “Extraordinary Literacy Learning!” in to hear about how we delivered a pilot (funded by the Australian National Vocational E-Learning Strategy initiative – Partnerships for Participation) adult literacy course entirely online using virtual classroom, blogs and other e-tools. Join us on Thursday Jan 24th at 23:00 GMT/UTC the time for you will vary depending on your timezone (check yours here) Thursday afternoon/evening in the USA, late night Thursday in Europe, and Friday morning Jan 25th in Australia – in the usual Blackboard Collaborate virtual room.